Vinyl records are back, and audiophiles love to listen to them because of their unique and rich sound quality. Playing vinyl records give a nostalgic feeling and if you’re an enthusiast and have a big collection of vintage records, a cool turntable will inspire you a lot. 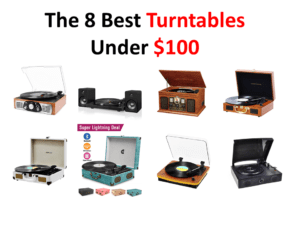 These turntables are portable and battery powered so that you can play them anywhere. This way of listening to music is very addictive as vinyl records offer a smooth, resonant sound that only high-quality turntables can provide. The Audio Technica AT-LP60BL has an amazing performance and affordable price. It is very easy to use and is a perfect turntable for people who are looking to start listening to vinyl records. Audio Technica has been in the sound industry for a long time, and it is well known for introducing quality products. The AT-LP60BL is a belt-drive turntable, that is, it uses a rubber belt. It has a compact size and is very lightweight. It weighs just 3 kg and is 3.8 inches high and 14 inches wide. You can choose the built-in phono preamplifier or an external preamplifier of higher quality. It has a 24-inch long cable that ends into stereo RCA plugs. There are four buttons on the front panel through which you can select the speed and cue and start or stop the music. On the top, there is a lever to select records of 7 or 12 inches. Just put the metal platter on the turntable and pull the rubber belt through the hole on the platter, then place the felt mat on the platter. After this, remove the cover protection from the cartridge, and you are ready to listen to your records. The stylus of the cartridge is user replaceable. This device ends the hassle of manually putting the stylus in the groove, as all you have to do is press the start button after putting the LP on the platter. After playing the last song on one side of the LP, it automatically lifts the tonearm and reaches the armrest. 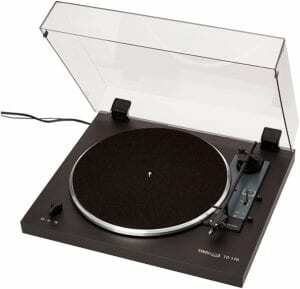 Overall, it is an ideal turntable for people who are looking to get back to vinyl records. Just press the button and enjoy the music. It has a built-in phono preamplifier. It has a user replaceable stylus. It gives an amazing performance while playing records. It doesn’t allow you to upgrade to a better phono cartridge as it is fixed. The Denon DP-300F has all the features you need to listen to your vinyl records. Denon is a well-known company, and it manufactures audio and video gadgets. 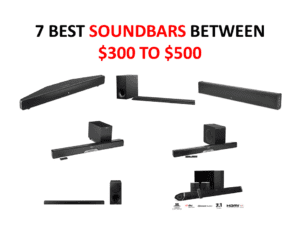 The company claims that it is the manufacturer of home cinema hardware. 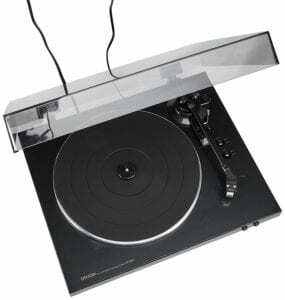 This automatic turntable is packed with features and is very easy to use. The Denon DP-300F has a built-in preamplifier that allows the listener to enjoy the highest quality sound. The preamplifier doesn’t have only amps with the input signal, and this feature makes it unique. There’s a dynamic balancing system and a removable headshell in the tonearm as well that allows it to perform in the best way. There is a pre-installed MM cartridge too, so you won’t need to change or upgrade anything. The turntable uses a belt-drive system that is driven by a DC-servo motor arrangement. You can choose from two speeds, 33 1/3 and 45 rpm, so it is very easy to use. You can switch to different speeds using the push buttons. The base of this Denon turntable is designed to reduce vibrations and hence, it protects the device from being damaged. The top is made up of aluminum platter which gives it a smooth and elegant look. It can play the whole side of the record and when it completes, the tonearm gets back to its original position, that is, to the armrest. If you want to stop the record in between, you can use a stop button for this, and this will also bring the tonearm back to the armrest. The MM cartridge is removable, which allows you to upgrade it whenever you want to, but the MM cartridge already present is an excellent choice for an automatic turntable. The Denon DP-300F is suitable for listening to phonograph records and not for DJ-ing purposes. The cartridge is removable and can be upgraded. The preamplifier is built in. The base has an anti-vibration system to protect from damages. The instructions are hard to read. If you have some collections at 78 rpm, the Thorens TD 170-1 can play them easily because it has an efficient motor that is built to perform to the fullest. It is a simple automatic turntable and delivers an extraordinary performance. It is a fully automatic turntable which enables you to enjoy music by pressing a single button only. It has a very simple design and is stylish enough to meet the needs of a vintage turntable lover. The design of this automatic turntable is made to resist vibrations that can cause damage to it. The outer is black and overall, the design is very compact. This turntable allows you to choose from three different speeds: 33 1/3, 45, and 78 rpm. The three-speed option is ideal for enthusiasts who have a big collection of records in their house. If you buy this model, you won’t even have to worry about which records are compatible because this model is compatible with all types. It has a built-in phono preamplifier that makes it easier to find a speaker that is compatible with it. Its sound performance is amazing as it lets you sit back and listen to your music. It gives a noiseless performance, so you can listen to your favorite music in a peaceful environment. The Thorens TD170 is very easy to use as it doesn’t need to be assembled or adjusted when it arrives. It is, thus, ideal for beginners who don’t want any hassle of adjustments and balancing the tonearm’s position. The phono preamplifier amplifies the signal of the turntable and delivers it directly to the receiver. The stylus and cartridge are also available separately. It is a very decent turntable and can play records that are even 50 years old. Moreover, turntable lovers love to own a receiver that doesn’t have a phono input. This turntable doesn’t even skip or scratch and plays very smoothly. It is compatible with all types of records. It doesn’t require any adjustments. It offers three speed choices. 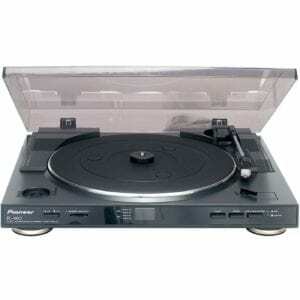 The Pioneer PL-990 is an entry-level automatic turntable that is very affordable and delivers an excellent performance. 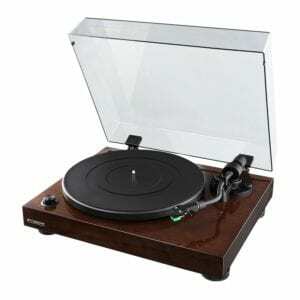 It is one of the best automatic turntables that are affordable and belong to a good brand. This turntable is used by many professionals and enthusiasts because of its durability and reliability. The design of the PL-990 is similar to the designs of the turntables found in the 60s and 70s. It has a simple design with buttons on the front panel. The buttons on the front include the play and stop buttons and a button that is used to switch the speeds between 33 and 45 rpm. It has a compact size and looks good in any room you want to place it. You can also use it for DJ-ing, but we’ll recommend a sturdier one for that purpose. It is not heavy and has a lightweight design. Overall, the design is very simple, but its performance is outstanding. It is a fully automatic turntable which delivers incredible sound quality. This turntable uses a belt-drive system and thus, it avoids vibration as compared to direct-drive systems. The anti-vibrating body protects the device from collision, shakes, and damages. It has cables for auxiliary line and a dust cover that protects the device from dust and damage. It is very simple to set up, and the instruction manual is easy to follow too. As the turntable is an entry-level one, it is beginner friendly and thus, you’ll have to spend less time to set it up and start playing your favorite records. The tonearm is in a perfect position and has a solid and smooth feel. The automatic system in the tonearm allows it to get back to the armrest after the record has finished. Most of the other vinyl recorders come with an adapter, which is a hassle, but this one can switch the speed between 33 and 45 rpm. The cartridge is fixed but is of good quality. All you need to do is press the play button, and the turntable will start playing your favorite music. The preamplifier is built in at the line level. It has an amazing sound quality. It has a pitch control. It has an aluminum platter. The cartridge is fixed and can’t be upgraded. It can pick up noises easily. It has no 78 rpm option. The RCA cable is short. The Fluance RT81 resembles Audio Technica in design and performs somewhat similar too. It is one of the best automatic turntables on the market. Fluance is not an old and famous company and has just stepped into this industry. The Fluance RT81 features a belt-drive system instead of direct drive and has an integrated phono preamplifier. It also lets you choose between 33 rpm and 45 rpm without having to switch the belt. The phono preamplifier automatically stops the platter when the arm reaches the middle of the record. Though it is an automatic turntable, it’s not a fully one as the tonearm doesn’t lift and return by itself like other fully automatic turntables do. It has an amazing sound quality and is very affordable too. Some people prefer the design and looks of the Fluance RT81 as compared to the Audio Technica product as it has an elegant walnut finish which gives it a vintage appearance. It has a heavy and sturdy design, so it can be compared to the old turntables. This turntable is famous for its high-performing speaker system and, thus, provides an accurate and crisp sound quality. The stylus is a diamond elliptical tipped one, and the tonearm is of S-type and made of aluminum. It takes only 15 minutes to assemble the turntable, but if you’re a beginner, you may take some more time to balance the tonearm. The built-in preamplifier can be switched on or off by a switch at the back of the deck. The auto-off feature of this turntable stops the record, but you’ll still have to lift the arm from the record. If you don’t enable the auto-off switch, the record will keep on spinning forever, and you’ll have to turn off the power physically. It has an amazing vintage design. There is no retractable tonearm present. It is not fully automatic. You have to enable the auto-off switch to make it functional. The Marantz TT42 is a slim and compact automatic turntable that delivers superb sound quality with the touch of just one button. This device will let you enjoy your vinyl record collection in a peaceful and serene environment. In spite of its good performance and high quality, its price is quite affordable. The Marantz TT42 has a low-coloration tonearm, and there is a DC servo motor that runs the belt drive system. The DC servo motor makes sure that it produces a rumble-free sound and right speed. The tonearm resists resonance and delivers a balanced and crisp sound to the listener. It has an aluminum platter and a magnet cartridge with a universal mount. The moving magnet cartridge gives a smooth response and proper tracking as it has been preset at the factory for this incredible performance. It has a heavy base design, and there is an RCA audio cable attached to it. The base is very sturdy and thus, the vibrations due to playing the record don’t affect it. It offers two-speed options, 33 1/3 and 45 rpm, and you can switch the speeds by using a button. When you press the play button, it starts playing the record automatically and accurately lifts onto the record groove. After the record has finished, it returns to the armrest. This feature saves the listener from the hassle of positioning the stylus manually. The Marantz TT42 turntable can combine old-school vinyl records with superb performance and features. The Ortofon Pro S Replacement Stylus is ideal for beginners who want to begin with a high-performing but affordable equipment. The spherical diamond stylus reduces scratching and if there is any rigorous activity at the turntable, the solid cantilever protects the equipment. It has an anti-vibration base. It allows switching between two speeds. Solid cantilever for the protection of equipment. The design seems a bit flimsy. The disc is supported at the edge only. The comeback of vinyl records has resulted in affordable and automatic turntables that allow you to enjoy the warmth and peacefulness of the records. 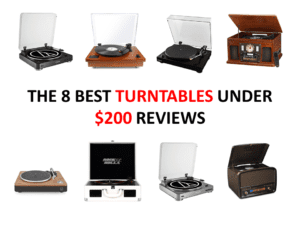 If you’re a beginner, you don’t have to worry about the hassle of using it because the vintage automatic turntables will give you the option of sitting back and relaxing while you listen to your favorite records. All the automatic turntables have, more or less, the same features, but some outclass the others in performance. 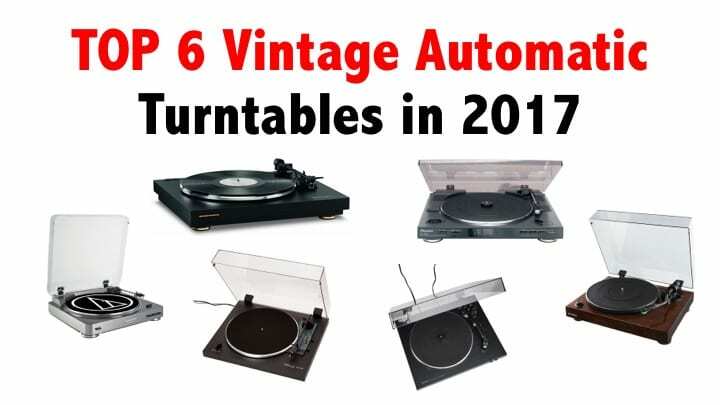 This post uncovered the best vintage automatic turntables in 2017 that will let you explore your record collection with a push of a single button. All these automatic turntables are very affordable and deliver superb performances. 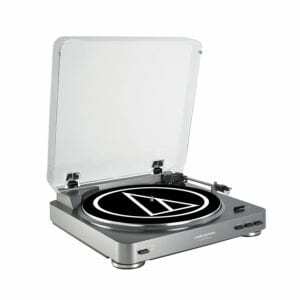 However, our top pick is the Audio Technica AT LP60 because it has all the features that one needs in an automatic turntable.